Since 1990, Heavybilt Manufacturing Incorporated has been on the leading edge of product design and development. It manufactured the first “feed buggy,” which is a trailer designed for smaller farmers and ranchers to be able to competitively buy in bulk. As the company, grew it added other product lines to counter the seasonal demand of the agriculture industry. With each new project, HMI broadened its target market. The company now offers products from coast to coast to the wildlife, brewing, food service, and construction industries. deliver, and setup a tank storage system without the assistance of additional machinery. Doubling its workforce over the past five years and tripling sales over that same period. The number of products Heavybilt offers and the markets it serves has doubled. Company leaders have invested $2 million in equipment and facilities expansion since 2008. HMI has completed API and ASME certifications. All employees are now trained on HMI’s quality management system, which includes regular safety operations. All welders are certified for the HMI production process. HMI has a close working relationship with Kay Watson, a manufacturing extension agent who works with companies in south-central and southeastern Oklahoma. 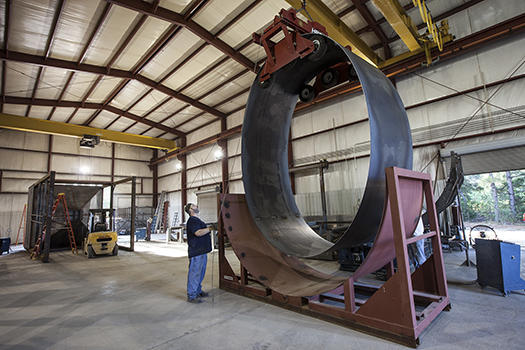 Kiamichi Technology Centers has played a key role in many projects. One of the secrets to the Heavybilt’s success is President Steve Cody’s ability to analyze changing market conditions and identify emerging needs. He then works with managers and employees to position the company to meet those needs in a cost-effective manner. It must be working. Business continues to expand in areas where the competition has yet to even recognize the coming need. Heavybilt Manufacturing headquartered in small community of Coalgate offers products from coast to coast to the wildlife, brewing, food service, and construction industries.